A local bus in Queens idles at the bus stop, the first of the route. Doors closed, plenty of seats available, plenty of passengers. The bus driver sits chatting with one of the latter. I tap on the door. She doesn’t acknowledge my existence, so I tap again. She’s in the bus stop, no signal indicates she's about to pull out, but she doesn’t open the door. I tap again and make some sort of gesture with my hands and face to say “what’s up?” She opens the door, doesn’t look at me as I use my Metrocard and thank her, then closes the door and pulls away a minute later. What was that? A morning express bus driver insists that, despite 20 years of express passengers standing on one side of the bus stop sign and local passengers lining up on the other side, that the bus stop is on the other side only and he will not stop where the passengers are lined up. The funny signs in buses saying the driver will stop to drop off passengers wherever they ask, barring dangerous conditions. When pigs fly…. ~ Molly Matera, signing off to explore more bus stops. This week, at 2 p.m. New York time, I saw the Donmar Warehouse’s current production of Coriolanus simultaneously with its London audience at 7 p.m. their time. The six camera set-up did more than justice to the production for the benefit of those of us who are far from the theatre’s Covent Garden location. Watching British theatre is fascinating to a U.S. audience as we recognize so many people from British television. For instance, in coming attractions for a production of The Curious Incident of the Dog in the Night Time, Una Stubbs (from the Gatiss/Moffat “Sherlock” presently running on PBS) appeared onscreen. Someone in the New York audience cried out, “Mrs. Hudson!” And now, back to “live” theatre. Coriolanus is a difficult play in which we’re hard pressed to actually like any of its characters. As a preview film reminds us, this is not the Rome of Julius Caesar or even I, Claudius, but long before those settings. It is primitive, there’s no such thing as Italy but rather a bunch of quarreling tribal territories. There will be blood. Rome is governed by the Senate, which is made up for the most part of “patricians,” or upper class and aristocracy. There are representatives (tribunes) of “plebeians” or commoners. The primary external enemy of these Romans is the Volsci, or the Volscians. At any rate, the people of Rome are hungry. The appropriate distribution of grain is at issue, with the patrician class getting most of it and the plebeian class getting little if any. The rancor of the plebeians against the upper classes and particularly the outspoken Caius Marcius opens the play. The problem is, the audience doesn’t know any of what I just wrote, so the fury of the plebeian class against Caius Marcius seems baseless. The title character, who starts out as Caius Marcius, is an exemplary soldier and leader of men in war. He also personifies the difficulty of a war hero re-entering civilian life in or out of politics. That’s on a personal level; Coriolanus also exemplifies a society teetering on the verge between tyranny and anarchy, in an ever-growing class war. 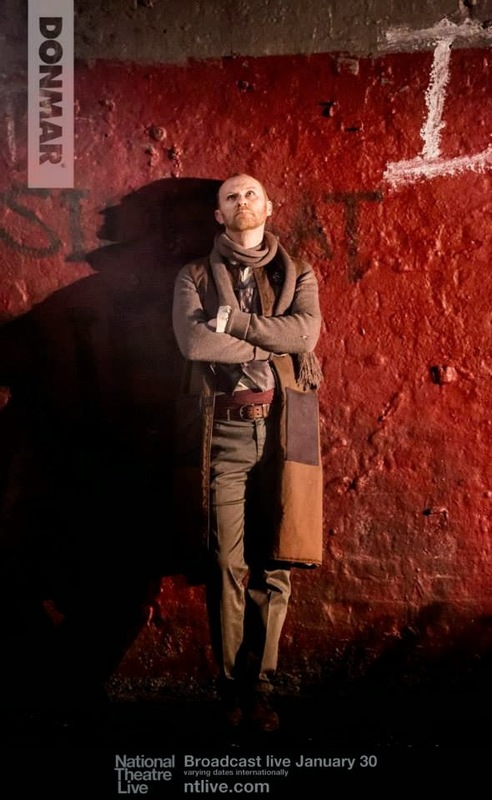 This Coriolanus is directed by Josie Rourke in the compact Donmar Warehouse, with a three quarter stage and a small cast. Director Rourke stages the play well in the confined space except that the design hasn’t given us clues, even in a slight costume change, when members of her fine company of actors change roles from Roman to Volscian. Tom Hiddleston grows from Caius Marcius to Coriolanus (an honorary surname based on his leadership in the conquest of Corioles) and back to a Caius Marcius we hadn’t previously met. Mr. Hiddleston emphasizes the human weakness in the man and wins us to his side no matter how close to fascism he steps. We see him bloody, watch him shower it off, and so see his wounds that he is unwilling to show the plebeians to get their sympathy or votes. This Coriolanus is staged to empathize with this individual man. And then he opens his mouth in anger and contempt and turns most people against him. He is undisciplined at best. Hiddleston is a hurricane strength force on that stage. 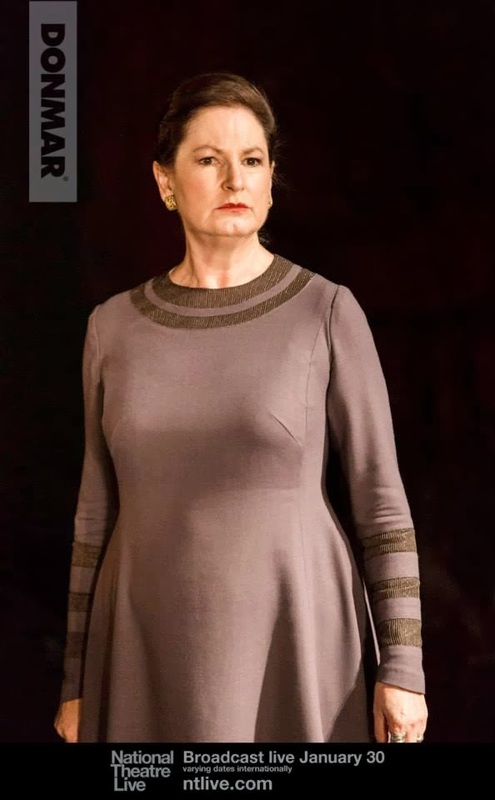 Deborah Findlay as his mother is a powerful and smug Volumnia, able to rule much of the Senate from her living room, but also able to humble herself by the end when Rome needs her to. Birgitte Hjort Sǿrensen as Virgilia was full of emotion and cried a lot, but to be fair the script doesn’t give her much to say. Peter DeJersey was noble and likeable as the general Cominius, powerful in his glory days, then broken after the banished Coriolanus’ rejection of him. 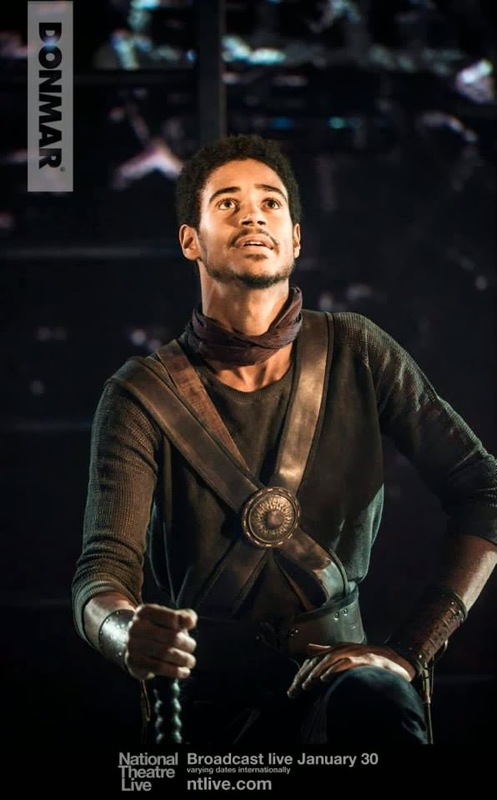 Alfred Enoch was a strong, warm and clear Titus Lartius. Mark Gatiss made for a highly intellectual and warm Menenius. 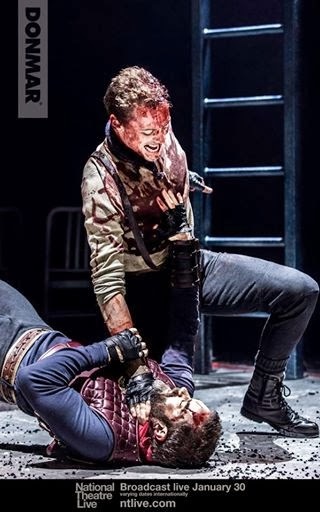 His belief in his own superiority aside, his fatherly feelings for Coriolanus and friendship with the family are as real as his attempts to negotiate a peace between the plebeians and Coriolanus. His heartbreak at his rejection by Coriolanus is shattering. The plebeian tribunes, Sicinia (Helen Schlesinger) and Brutus (Elliot Levey) are truly vicious and as smug as Volumnia. They set us up to think as little as possible of the plebeian class — a.k.a. “us” — since they are as manipulative of the plebeians as the patrician class is dismissive of them. What reads as overreaction to what has not been seen makes the plebeians seem ignorant and hateful. Helen Schlesinger’s performance as tribune for the plebeians was so fine that I utterly despised her. Director Rourke spoke at the interval (British for intermission) about the youth of this Coriolanus, which really does help make his behavior more understandable, even forgivable, if not acceptable. 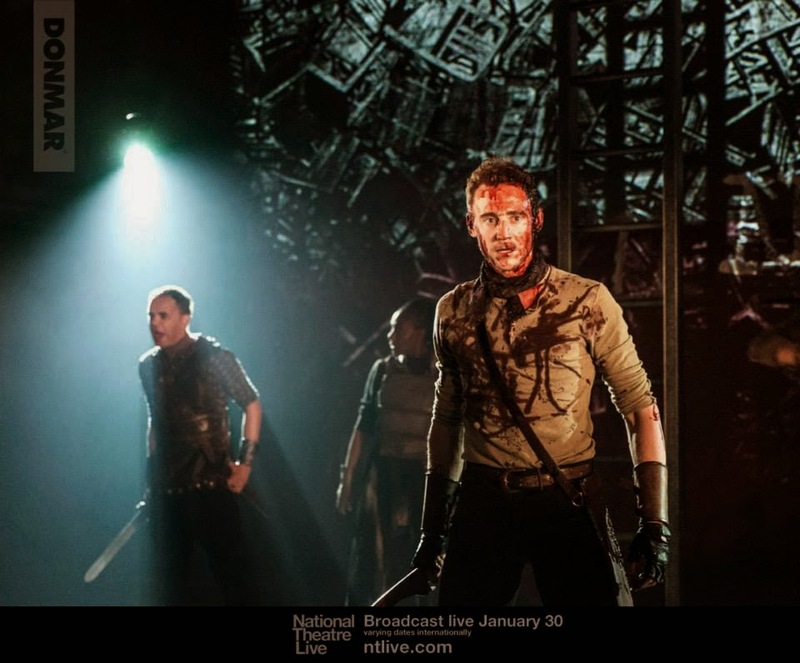 The audience is not siding with Coriolanus just because Tom Hiddleston is so attractive. The plebeians are portrayed as weak, malleable, and consequently untrustworthy. Their grievances are not clearly aired, just the word “grain” tossed about without explanation — perhaps the audience is expected to know. Or perhaps in Shakespeare’s time there was a similar enough situation in England for the audience to know the Commoners’ grievances without having them spelled out. The play’s love/hate relationship is between warriors, brothers under the skin. Aufidius, the Volsci commander played by Hadley Fraser, is the Volscian enemy of Rome (as opposed to the Roman enemies of Rome already mentioned), loving and hating Coriolanus. He’s overtly emotional, practically weepy when the banished Coriolanus comes to join with him, and decidedly sad when he orders Coriolanus’ death. Mark Stanley plays several roles but shines as Aufidius’ second in command. The evening’s performance was engrossing, active, and intimate. Fight direction by Richard Ryan was tightly staged and frightening. 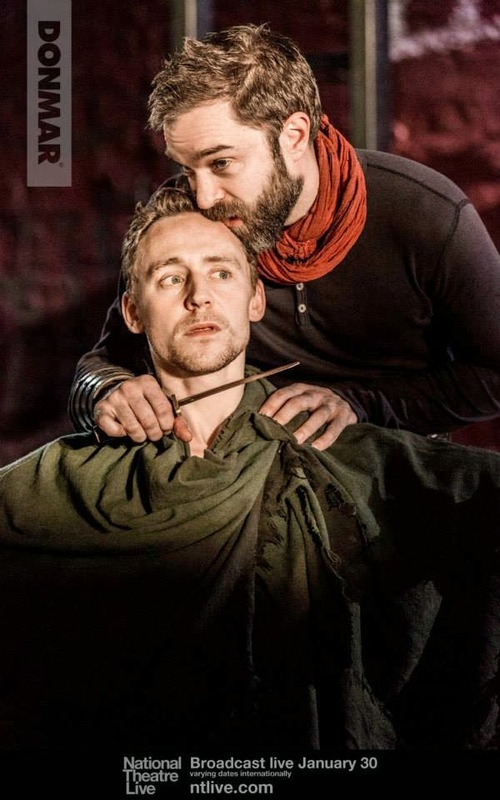 As Rome betrayed Coriolanus by banishing him, he, like the ill-tempered child he is, betrays Rome in turn. While he is stone-hearted to his former general Cominius and even his father figure Menenius, the pleas of his mother, wife, and son turn him from his vengeance, which of course determines his own fate. When the end comes it is swift and shocking. ~ Molly Matera, signing off to read some ancient history.